A drama and comedy about survival, Life Is Beautiful courageously uses the Holocaust as a backdrop to portray the power of familial strength in the face of adversity. 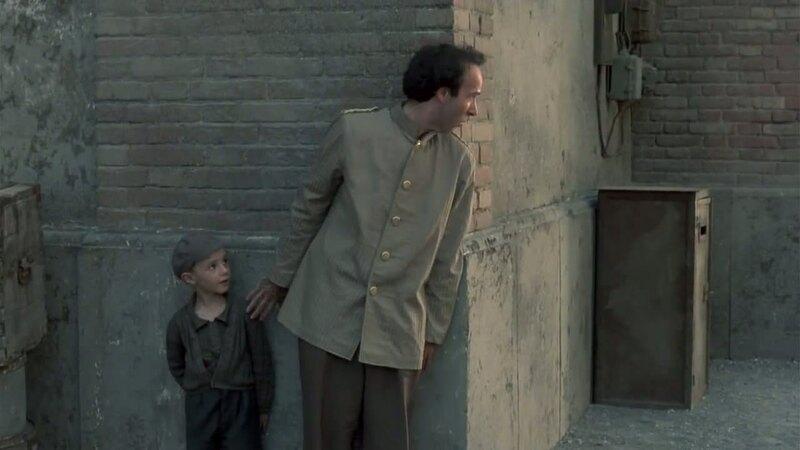 In Italy just before the start of the Second World War, jovial Guido (Roberto Benigni) relocates to the big city where he dreams of opening a bookstore. He bumps into local beauty Dora (Nicoletta Braschi) and falls madly in love with her, although he is a humble Jew and she is close to being a member of society's elite. To make ends meet, Guido works as a waiter at the hotel where his uncle (Giustino Durano) is the maitre d'. A regular restaurant customer is German Doctor Lessing (Horst Buchholz), who enjoys exchanging mental riddles with Guido. Guido and Dora finally get married and have a son Giosuè, just as fascism and a wave of anti-Jewish sentiment sweep through the country. Late in the war Guido and Giosuè, now about four years old, are rounded up by the Nazis and sent to a concentration camp. Although Dora is spared, she insists on joining her family. To keep his young son safe, Guido pretends that camp life is a great adventure game, with points awarded for good behaviour. 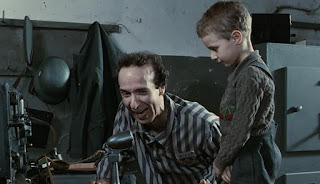 Directed and co-written by Benigni, Life Is Beautiful is inspired by Benigni's father and the book In the End, I Beat Hitler by Rubino Romeo Salmonì. This is a brave attempt to mix comedy with one of history's worst human atrocities, and for the most part the experiment works. By zooming in on the father-son dynamic the story stays small and intimate, and the message of a father's immense love and sacrifice takes nothing away from the grim reality of life and death at the camp. The film is almost equally divided into two halves, with only the second part occupied with surviving the camp. 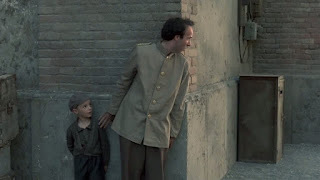 The first hour is much weaker, as Benigni really takes his time to create the context. Introducing the character of Guido takes forever, and his pursuit of Dora suffers from repetition and often descends into cheap slapstick. Many events from the introductory scenes do resonate later in the film, but all the set up work could have been much more sharply handled. Once the story moves into the camp the tone shifts into something more serious, Guido deploying all his quick wit towards protecting his son and creating the illusion of a game. A highlight features Guido pretending to translate the barked instructions of a Nazi soldier while in fact conveying to his son the behaviours that could mean survival. Giosuè is smart enough to be increasingly skeptical as the days pass, and Guido has to resort to reverse psychology and finally a desperate gambit involving Dr. Lessing to prolong the artifice. In the meantime Dora is in the women's section of the camp segregated from her husband and son, and Guido also has to find ingenious ways to communicate with his wife despite the physical separation. Benigni overacts with no restraints from his director self, while Braschi compensates with a more soulful and effective performance. Life Is Beautiful celebrates humanity's stubborn endurance, love fueling perseverance in the darkest places.